An eco warrior is demanding Royal Mail pay £800,000 in littering fines after he spent six years collecting 10,000 elastic bands ‘deliberately dropped by posties’. 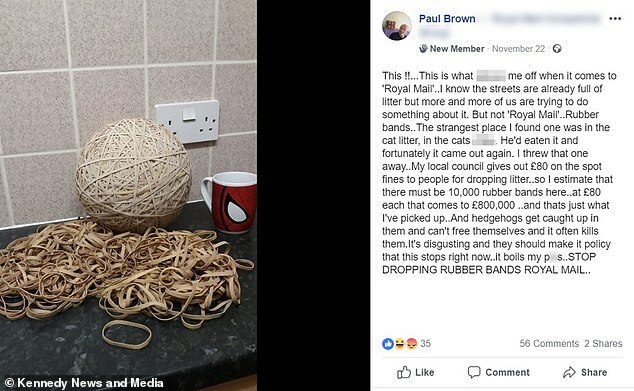 Paul Brown dubbed postal staff ‘lazy and thoughtless’ after he collected enough rubber bands to make a ball the size of his own head. Now the 48-year-old has called on the government to issue the eye-watering £800,000 charge – an £80 littering fine for every band he has picked up off the floor. However numerous Royal Mail workers pointed out that they would not be dropped deliberately and that they were in fact bio-degradable. 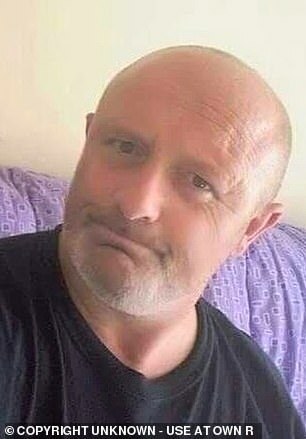 In a foul-mouthed online rant, Mr Brown claimed he had even found a band in his cat’s litter tray after it was eaten – but admits he didn’t use that one for the giant ball. Mr Brown took to social media to vent his wrath at Royal Mail over the bands, and claims the end of his street is their ‘favourite place’ to ‘intentionally’ leave them. Mr Brown, from Wallasey in Merseyside, said: ‘This is what p***es me off when it comes to Royal Mail. ‘I know the streets are already full of litter but more and more of us are trying to do something about it. ‘But not Royal Mail. The strangest place I found one was in the cat litter, in the cat’s sh**e. He’d eaten it and fortunately it came out again. I threw that one away. 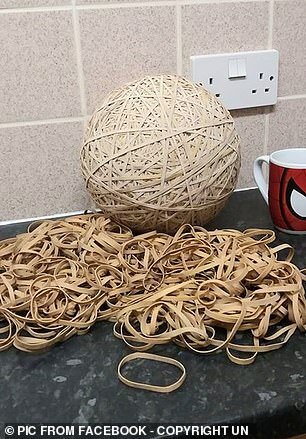 ‘My local council gives out £80 on the spot fines to people for dropping litter so I estimate that there must be 10,000 rubber bands here at £80 each. ‘That comes to £800,000 and that’s just what I’ve picked up. And hedgehogs get caught up in them and can’t free themselves and it often kills them. His obsession originally saw him out looking for them at weekends but after being ‘unable to stop thinking about them’ he began doing it daily. In response to his post, others rushed to the defence of postmen and women arguing that they did not do it intentionally and the bands are biodegradable. Paul argued he had seen staff dropping elastic bands at the end of his street and that he found himself ‘thinking about it all week’ so started collecting them every day. Paul said: ‘I started picking them up on weekends but soon found myself thinking about it all week and before I knew it I was doing it every day. Angry mail staff were eager to correct Paul for tarring all workers with the same brush and claimed they always tried to pick up the bands where possible. Karen McLean said: ‘I’m a Postie and believe me, we don’t do it intentionally. Sometimes you don’t know you have dropped elastic bands as they do snap. Hamish Butler said: ‘I am a postie. It’s not Royal Mail at fault, we are told all the time to make sure we don’t drop elastic bands on the streets. However Paul hit back, adamant that the posties were dropping them on purpose and dlieberately choosing the end of people’s streets as their ‘favourite place’. Paul said: ‘[Of] course they do it intentionally. Why not re use them and save a few quid? Do their bit. ‘It would be so easy… and besides that, it’s illegal. How dare they be so lazy and thoughtless. In response to Paul’s concerns, Royal Mail claimed they had introduced biodegradable bands and encouraged people to reuse them wherever possible. A spokesperson for Royal Mail said: ‘Royal Mail recognises that rubber bands that litter the ground present a threat to wildlife as well as representing a needless expense. ‘Every year, we use around 338 tonnes of elastic bands to keep bundles of mail together. ‘In 2016-17, we reduced the number of rubber bands we purchased by eight per cent. We achieved this reduction by encouraging our people to reuse elastic bands as much as possible.